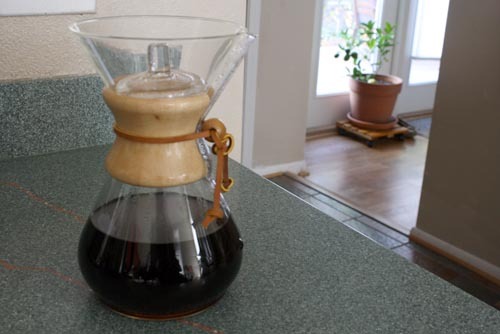 Have you wanted to brew your own Chemex coffee but were a little intimidated? Here’s how to use a Chemex, step-by-step, with pictures. For folks unfamiliar with Chemex, it’s a special coffee-brewing gadget that is supposed to make extra stellar coffee. And I’m convinced that it does. You can see our Chemex in the photo above. OK, so before I even start getting into how to use a Chemex, I think I need to tell you guys that I am not any sort of rep for Chemex or the filters I talk about below. In fact, when my husband told me that he bought a Chemex, I rolled my eyes a little, thinking that it was just another thing we’d need to store in the kitchen. Consider me a Chemex convert! 1. Grind your beans, and boil the water. Your Chemex will come with instructions that tell you how much of each you need to make however much coffee you like. 2. 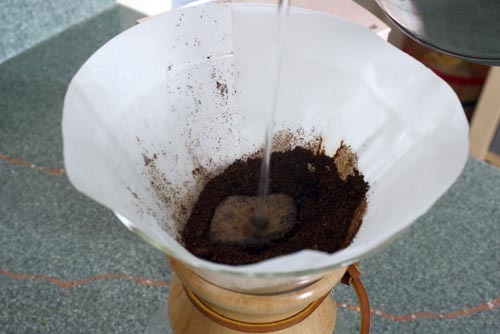 Moisten the special Chemex filter, then fit it into the cone at the top of your pot. If you’re using the paper filter, you need to make sure that the side with three layers is facing the lip of the jug. 3. Pour your grinds into the filter, and use your finger or a spoon to make a well in the center of the grinds. 4. Drizzle just a bit of water into the well, and wait for a moment. You’ll see the coffee “bloom” in the center. 5. Once you see the bloom, you slowly pour the rest of the water in a circular motion, making sure to get all of the grounds. 6. Let all of the water filter down into the base, and when it’s all done dripping, you’re ready to pour! Ayayay! That sound like a lot of work for a cup of coffee, right? It was a bit time-consuming, but the result is a brew that is super tasty without that bitterness that you associate with most drip coffee. In fact, many people swear that you should drink your Chemex coffee black. I still opted for some almond milk in mine, and it was one of the best cups of coffee I’ve ever had! The only thing that got me down about our Chemex is that it seemed like you had to use those paper, disposable filters every time. Boo! 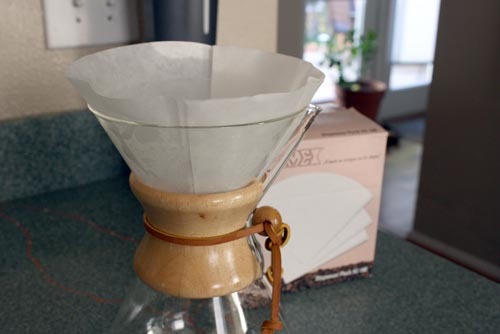 I was pretty bummed about that, until a super kind reader on our Facebook page pointed me to this reusable Chemex filter! You can bet that we’ll be making the switch as soon as it gets to our doorstep. Are there any other Chemex fans out there? 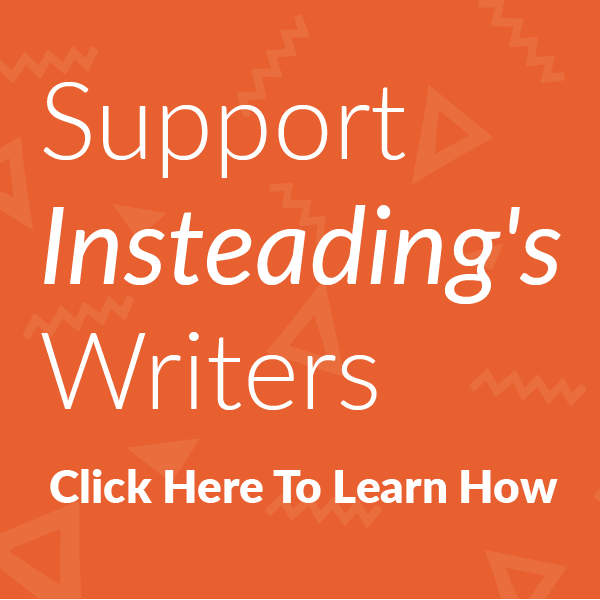 I’d love to hear what your experiences were!